First Reading: Acts of the Apostles 2:1‑11. Second Reading: 1 Corinthians 12:3-7.12-13. What does the Spirit do? The Spirit permeates everyone who is a member of the Church, ensuring that we are all part of the one body of Christ. Take this reading slowly: there is a great list in the second paragraph, contrasting ‘variety’ with the ‘same God’. Emphasise the words ‘for a good purpose’. In the final paragraph the important words to get across are ‘one Spirit’. be careful with the first sentence of the last paragraph: the image of the body is an important one, because it explains how so many of us can be united in Jesus. Alternative Second Reading: Romans 8:8-17. The hardest thing about this reading is the constant repetition of the words “spiritual” and “unspiritual” – though in fact it is the point of the reading. You have to understand that Saint Paul is trying to underline the role of the Holy Spirit – the Spirit that has made a home in us, and therefore makes us “spiritual people”. As with many readings from the letter of Saint Paul, the reader needs to spend quite a while preparing this, otherwise it will come across to listeners as incomprehensible. The secret is to take your time, and weigh every word: make sure you understand Saint Paul’s points, and work out where to pause and where to breathe, and once again, take your time! Pentecost Sunday is a Day of Special Prayer for the Church. This is rather a broad invitation to prayer and can generate some debate about what exactly we are praying for! Is it the Church throughout the world, or the Church in our Diocese or Parish? Do we pray for the Pope or our parishioners? Do we pray for the UCM and CWL and SVP, or for our young people? The answer, of course, is all these things at once! The Church is not “either/or”, but “both/and”! 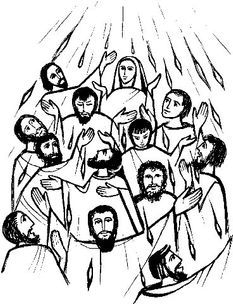 The mystery of Pentecost is the presence of the Holy Spirit in all of the Church, in all its members, in all times and places. Celebrating this feast must celebrate that presence, and so our prayer “for the Church” must be as universal as possible. "As the Father sent me, so I am sending you: receive the Holy Spirit." 1152: Sacramental signs. Since Pentecost, it is through the sacramental signs of his Church that the Holy Spirit carries on the work of sanctification. The sacraments of the Church do not abolish but purify and integrate all the richness of the signs and symbols of the cosmos and of social life. Further, they fulfill the types and figures of the Old Covenant, signify and make actively present the salvation wrought by Christ, and prefigure and anticipate the glory of heaven. 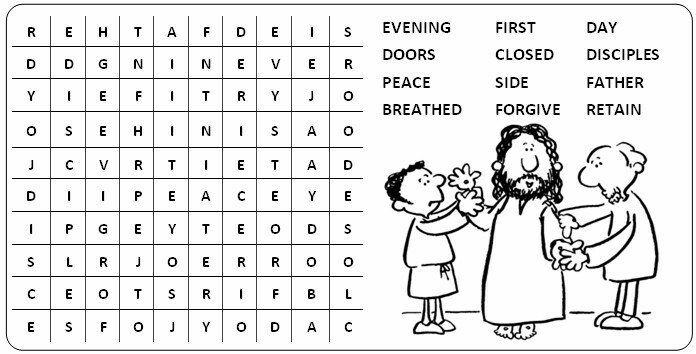 Click on the link to get this week's Gospel based Sunday Wordsearch. Feel free to copy and paste it into your parish publications.